Lou Myers has spent a lifetime enjoying and promoting the benefits of physical activity for health. Lou was first introduced to formalised exercise when he joined the army aged just 14. Throughout his 26 years in the Royal Artillery and his subsequent eclectic range of careers as an actor, dancer, butler and merchant seaman, the one constant in his life has been long-distance running. Lou, now a youthful 87, has completed dozens of Marathons – including several London’s – and boasts a personal best over 26 miles of just 2 hrs 41 minutes. But his specialism is in much longer distances, usually over mountainous terrain. He has completed the South Downs Way 80 mile race, the Grand Canyon Rim to Rim to Rim (56 miles) and, just a few years ago, the infamous Leadville Trail 100. Known as the ‘Race In The Sky’ the Leadville is a 100 mile run across the Colorado Rockies at altitudes of up to 2 miles! 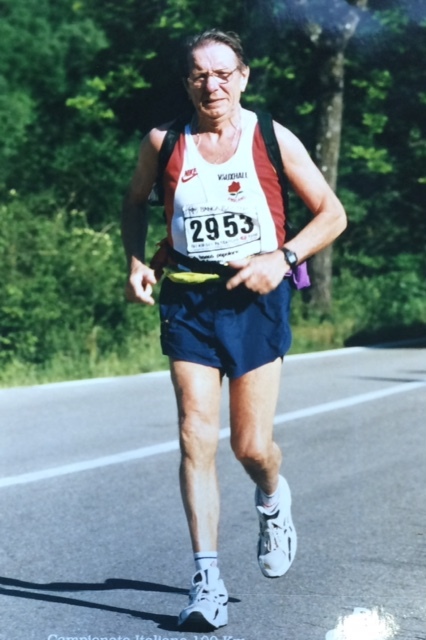 Even a diagnosis of prostate cancer couldn’t stop him running and, after finishing his chemotherapy treatment and receiving the all-clear in February 2010, Lou got training again for the Del Passatore 100km in northern Italy. On 30th May 2010, Lou completed the Del Passatore – the oldest competitor to do so – and, in the process, raised over £1000 for the cancer unit at University College Hospital where he was treated. Lou regularly trains at our gym and is looking forward to the Jubilee Hall Trust 10k Trail Run on Hampstead Heath on Saturday 19th September! Click here sign up to the race and qualify for FREE use of The Armoury.